Achilles tenosynovitis is an inflammatory condition of the sheath or layer surrounding the Achilles tendon. It is sometimes also known as paratenonitis. 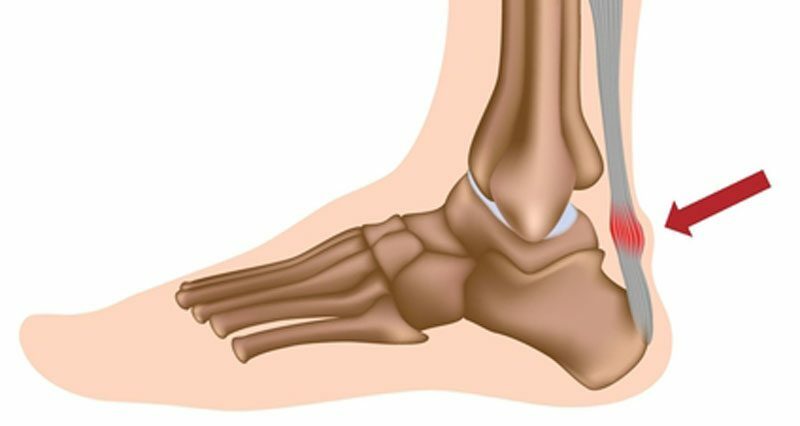 It is an overuse injury which affects the sheath surrounding the Achilles tendon, rather than tendonitis which is the degeneration of the tendon itself. Read more on the causes, symptoms, and treatment of this Achilles injury. Symptoms of Achilles tenosynovitis include pain in the Achilles tendon. The Achilles tendon will be painful to touch. Pushing up onto tiptoes or stretching the calf muscles may cause pain in the Achilles tendon. The tendon may appear swollen or thickened and a creaking sensation called crepitus may be felt when moving the ankle. Achilles tenosynovitis is an overuse injury which occurs due to repeated microtrauma of the sheath which surrounds the tendon. It is most common in runners and those involved in repetitively pushing up on the toes or marching in heavy boots. Tight calf and Achilles complex. A sudden increase in training or hill walking/running. A change in footwear which is less supportive. Going from wearing high heels every day to flat shoes. Achilles tendonitis or more accurately Achilles tendinopathy is a degenerative condition of the tendon itself. Achilles tenosynovitis is a similar condition of the sheath which surrounds the tendon rather than the tendon itself. In terms of symptoms, they are very very similar and it is practically impossible to differentiate between the two conditions without investigations such as MRI or ultrasound scans. In a large number of cases, both conditions exist together. As a treatment for the two conditions is much the same, exact diagnosis is often not necessary. Rest from the activity (or activities) which aggravate the condition. Apply ice or cold therapy products to the tendon for 15 minutes every 3-4 hours to ease pain, swelling, and inflammation. Providing it is comfortable to do so, gently stretch the calf muscles. Recommend anti-inflammatory medication in tablet or gel form. They may also use electrotherapy treatments such as ultrasound or laser. Sports massage to loosen the calf muscles may be beneficial also. Specific sports massage called frictions can be applied to the tendon itself to encourage blood flow and break down adhesions. A sports injury professional will advise on a rehabilitation program. Eccentric calf exercises such as heel drops are the best exercise for Achilles injuries. If conservative treatment fails, a corticosteroid injection may be administered.